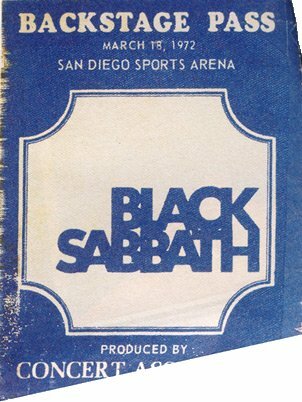 Was at the March 18, '72 show in San Diego. Black Sabbath got boring(Ozzy with the peace sign & all). This is when I 1st got into Yes!!!! In the latest (5/15/2003) edition of Rolling Stone (issue #922), rock journalist and screenwriter Cameron Crowe penned an article called “The Backstage Pass”. Interestingly enough, it was his experience at this show that inspired a very memorable scene in ALMOST FAMOUS. In the movie, William (a fictional representation of the young Cameron Crowe) is standing at the backstage door of the San Diego Sports Arena. He truthfully tells the doorman that he is on Black Sabbath’s guest list, since he is supposed to interview the band. William is repeatedly turned away and watches as Black Sabbath’s limousine whisks the band inside the venue, as William waits in frustration for an opportunity to get in. After a while, he bumps into Penny Lane (played by Kate Hudson), a groupie who helps in get in with one of the opening acts, the fictional Sweetwater. Not that I will remember that menacing guard or his name for the rest of my life (Scotty! ), or even the name of the kind concert promoter who eventually took pity on me (thank you, Larry), but I did re-create this scene in the movie ALMOST FAMOUS to help exorcise the lingering pain. And it was Larry who knew the power and the iconography of the backstage pass when he finally pulled a stack from his pocket, withdrew one and handed it to me with great aplomb, bestowing a key to the castle with simple advice. “Put it in plain view”, he said, “and look like you belong”. 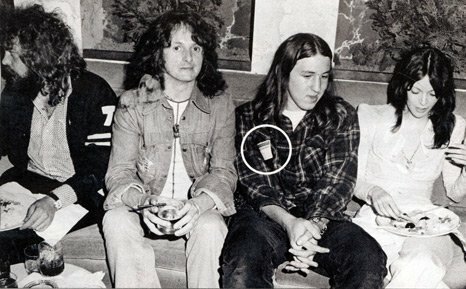 The article also includes this picture of a 14 year old Cameron sitting next to Jon Anderson backstage at the venue, as well as the actual backstage that got him in! To read the complete article, be sure to pick up the newest Rolling Stone.